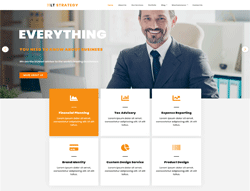 LT Strategy is premium Joomla template tailored for business or creative websites. This is professional template to convey your companys products and services by providing an effective design to make viewers get interested in your business at first sight. LT Strategy builds on strong framework with fully bootstrap under 100% responsive layout (support for mobile devices), powerful shortcodes, unlimited position and easy to drag-drop layout content. This template builds with 4 color styles. If you like another color without 4 default color styles, you can change it via Template Settings easily with unlimited colors based on Color picker Tool.